As most of you know – aside from those digging a large hole for themselves to hide in to avoid such things - Valentines Day is coming up…Did I hear a collective groan? Ah yes, the holiday of love and romance…or commercialism and tripe. Depends which way you look at it of course. Never has their been a more ironic (or shall we say forced) holiday. Here’s the thing, you ask most men about Valentines Day and they get that look…that deer in the headlights, pressure filled sick look that says, ‘oh dear god, again? I just managed to get thru Christmas and I totally screwed that up by getting her a vacuum instead of that bracelet she wanted!’ And then there are the women – I’m talking the majority here, there are always exceptions – who look forward to the day with heated anticipation for that concentrated dose of romance. And hence, the two genders meet in the middle – sometimes begrudgingly - and let the fun begin. Me, I’m with the skeptics on this one (something tells me you’re not surprised), I’ve always found the holiday to be a whole load of unnecessary pressure and mass imposed harmony. Have you ever been on a romantic holiday and have been looking forward to it for ages, and then fight the entire sodding time? It’s called pressure folks. That’s her in a red dress flaunting her perfect figure all over the place. How many arguments do you think kick off as soon as Valentines Day hits, purely because of the heavy expectation? She wants a candlelit dinner awash in chocolate covered strawberries and a card that lays out his feelings one by one in an effusive fashion, and he just wants to get out of the evening alive without stepping in any minefields. 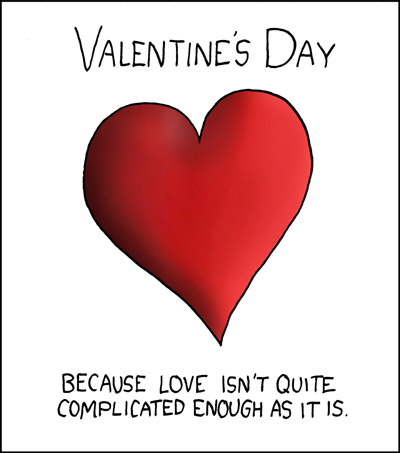 It’s also the blatant commercialism that makes me want to run screaming back to the land when love was left the heck alone – the cards, chocolates, heart shaped everything (Even cheese. Heart shaped cheese! Almost makes me lactose intolerant), the restaurants flaunting their ‘romantic’ deals. All designed to make you and your partner feel ‘in love,’ and if you don’t, well apparently you’ve failed in the eyes of St. Valentine. Who was this b*stard anyway? Then there are those that have to sit ringside and watch this whole spectacle with no 'valentine' or companion in sight (although some one would say that they are getting off easy). The ones that have to walk by the windows for over a month (actually two, as they now start promoting the Loooove day two months in advance) and get inundated with phrases like ‘You’re the one, how I love thee, you complete me, you had me at hello Valentine! !’ I’m thinking that is enough to send the desperate single folk off a high ledge. Now, don’t get me wrong, I love romance – yes you heard me, I love it. After all, I am a woman with red blood in my veins; I am not totally jaded. But I like romance to come spontaneously any day of the year – spontaneity on the receiving end of course; honey, you go ahead and plan your little heart out! – and not because a day dictates it and says that is the day we must express as much love as possible. There is something beautifully organic about romance that cannot and should not be messed with – so Hallmark, be warned. Us true romantics out there don’t need your cards and heart shaped Goudas.